Alumnae experts in environmental action, brain research, public policy, and female sexuality received recognition during the reunion celebration. From left: Wolf, Hatten, Andrews, and Berman. Wolf was a founder and then executive director of the Environmental Action Coalition, which started New York City’s first Earth Day celebration in 1970. After retiring from EAC, she became an environmental education consultant and coauthored the book Plastics: America’s Packaging Dilemma. She has introduced inner city youth to the joys of nature through the Urban Woodlands Project and has worked to include environmental education in standard school curricula. 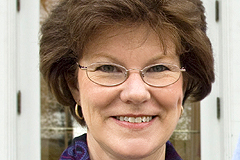 She established an endowed fund at Hollins to support the environmental studies program. Hatten received a Ph.D. in biochemical sciences from Princeton University and did post-doctoral research in neuroscience at Harvard Medical School. She joined Rockefeller University in 1992 and was appointed the university’s first female full professor and the first female to lead a research laboratory there. Her work has implications for conditions that are partially due to developmental abnormalities in the brain, such as learning disabilities, childhood epilepsy, schizophrenia, and autism. Her work on cerebellar development may one day inform research on treatments for childhood cancers. Hatten’s mother, Mary Lou Payne Hatten ’46, and aunt, Ann Payne Wood ’58, also graduated from Hollins. Andrews, a former advisor to President George W. Bush and the World Bank, has been a strategist and consultant to corporate, public sector, and nonprofit clients all over the world. She earned an M.P.A. from the John F. Kennedy School of Government at Harvard, where in 2010 she was a resident fellow in the Institute of Politics. In 1995 and 1996, she lived in Macedonia and set up a new management structure for the Open Society Institute Macedonia. She also developed programs for the International Foundation for Election Systems and observed more than two dozen elections in a dozen countries. Andrews is vice president and senior advisor for ViaNovo, a Washington, D.C., consulting firm. Berman is a renowned expert and pioneer in the field of female urology and female sexual medicine. She earned an M.S. degree from the University of Maryland Medical Center and a medical degree from Boston University School of Medicine. She cofounded the Female Sexual Medicine Center at UCLA and founded the Berman Women’s Wellness Center in Beverly Hills. She has appeared regularly on Good Morning America and been featured on the Oprah Winfrey Show, Larry King Live, and 48 Hours and in many leading magazines and newspapers. She has lectured worldwide and written extensively on women’s sexuality. 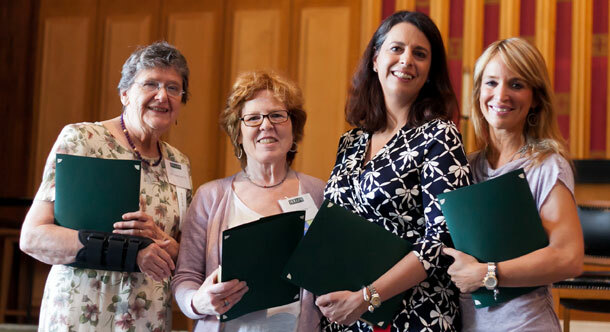 The Distinguished Alumnae Award honors those who have brought distinction to themselves and to Hollins through broad and inspiring personal or career achievements; local, national, or international volunteer service; or significant contributions to society. To nominate an alumna or learn about previous winners, visit www.hollins.edu/alumnae/alumnae_awards.